In July I took my birthday cake over to some friends’ house to share with them and their 3-year-old daughter. She always gets excited when I bring over treats. She likes sugar, so obviously we’re friends. While we were all enjoying our dessert, I remarked that the cake consistency with the coconut whipped cream frosting reminded me of whoopie pies! Actually, I said, “I could totally make these into Ho Hos.” But after a quick google search, my terminology was corrected. Vegan Whoopie Pies it was! These little gems are kind of amazing. 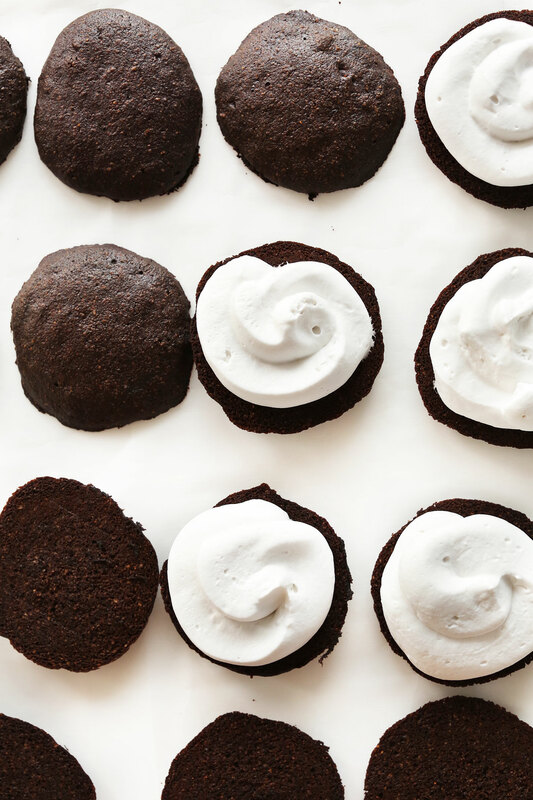 Fluffy little chocolate cake-cookie hybrids filled with fluffy coconut whipped cream make a light, satisfying “cookies and cream” dessert. This recipe is simple, requiring just 1 bowl, easy methods, and basic ingredients. Plus, it also comes together in about 2 hours (after your coconut cream is chilled overnight). The extra planning ahead is totally worth the effort. Make these as a lighter dessert to have on hand during the week, or for special occasions like birthdays, baby showers, parties and more. Since they’re both vegan and gluten-free, they’re the perfect treat everyone can enjoy. Three more perks? They’re naturally sweetened (besides the coconut whipped cream), 170 calories each, and can be made up to a couple days in advance so you can plan ahead and save time. If you give these a try, let us know by leaving a comment and rating the recipe! It’s super helpful for us. And while you’re at it, take a picture and tag it #minimalistbaker on Instagram so we can see! We love seeing what you come up with. Cheers, friends! 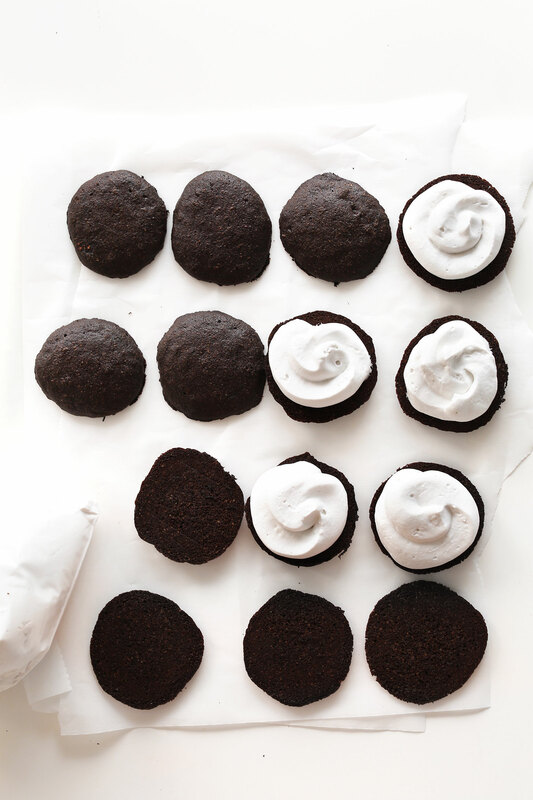 Fluffy, amazing vegan whoopie pies made in just 1 bowl with simple methods! Almost 100% naturally sweetened, gluten-free, and so delicious. In a large mixing bowl, prepare your coconut whipped cream with your chilled coconut cream. Follow these instructions to make a double batch, sweetened to taste (I found 6-8 Tbsp (42-56 g) to be the right amount // amounts as original recipe is written // adjust if altering batch size). Transfer whipped cream to a large freezer bag (for piping) and set in the refrigerator to chill completely. Rinse out the mixing bowl to use for the batter. Measure out almond milk in a liquid measuring cup and add apple cider vinegar (or lemon juice) and baking soda and stir. Set aside. In your large mixing bowl, prepare flax eggs by combining water and flaxseed meal. Let rest for 5 minutes while you prepare your other ingredients. Add the oil, coconut sugar, and maple syrup and whisk to combine. Next add applesauce, vanilla, and salt, and whisk to combine. Then add almond milk mixture and whisk again until everything is thoroughly incorporated - about 30 seconds. Lastly, add baking powder, cocoa powder, almond meal, oat flour, and gluten-free flour, and whisk to combine, making sure no large clumps remain. Transfer batter to the refrigerator to chill/thicken for 20 minutes, and preheat oven to 350 degrees F (176 C). Grease two large baking sheets with non-stick spray (if you don’t have two baking sheets, just use one and bake the cakes in 4 batches // use fewer or more baking sheets, as needed, if altering batch size). Once the oven is preheated, scoop out 1 heaping Tbsp amount of batter onto the prepared baking sheets, leaving at least 1-inch of room for spreading. Use your tablespoon to slightly spread them into a small disc. One standard baking sheet should fit 12 cakes. Repeat on second baking sheet. Bake for 10-14 minutes, or until the edges appear dry. (I found 12 minutes to be the perfect time.) Remove from oven and let rest on baking sheet for 5 minutes, then carefully transfer to cooling racks to cool completely. Repeat this process, baking the mini cakes until all batter is used - you should have about 48 total cakes (amount as original recipe is written // adjust if altering batch size). Once the cakes are completely cooled to the touch, clip a small corner of the coconut whipped cream bag off and pipe a generous amount (see photo) of coconut whipped cream onto the under-side of half the cakes (24 as original recipe is written // adjust if altering batch size). Carefully top with another cake of similar size and shape and press down slightly. Arrange on large serving plates or a cooled baking sheet and cover loosely with plastic wrap. You can enjoy these immediately; however, I found them to hold up better after 1 hour of refrigeration (and even better after 6 hours or overnight). Leftovers will keep covered with plastic wrap in the refrigerator for 3-4 days. *For the gluten-free flour blend, I've tested both with my DIY Blend and Bob's Red Mill Gluten Free 1:1 Baking Blend and found that I slightly preferred the Bob's blend in terms of the cake's texture. However, both will do! *Nutrition information is a rough estimate calcualted with generous amounts of coconut whipped cream filling. *Prep time does not include chilling coconut cream overnight. *Adapted from my 1-Bowl Chocolate Hazelnut Cake. How well do you think these will hold up if mailed in the post (Frozen)? Hi Anna, we aren’t sure that would work very well since the coconut whipped cream will quickly loose form if they don’t remain chilled. Hope that helps! These were to die for! I made them for Halloween. They were a BIG hit. I love them and will be making these for MANY more occasions. Great! Thanks for sharing, Sandra! These are DELICIOUS and FUN to make!! Made them for Halloween party tomorrow night. As the filling, I used SO Delicious Coco Whip! Thanks for a great recipe! Can we substitute pineapple for applesauce? Yes, that should work though it may change the flavor slightly! Thinking of making these for a birthday! Can I use all purpose flour instead of the gluten free flour? Will the measurements be the same? These are incredible! I’ve mad them 3 times the last few weeks and they’ve been a big hit with everyone I’ve shared them with! its a call for a dinner with vegans friends ! I have never been disappointed by one of your creations, and im sure this one will not be an exception!! These were a hit! Made vegan cream cheese icing instead of coconut cream. Will make again for sure! Absolutely delicious!! I didn’t have the patience to let the coconut cream go overnight so I put it in the freezer and kept checking on it and stirring it. Also, I think I made them a little too big and soft (I was worried about burning them as they were so flat so I baked them a shorter time) so they were best straight from the freezer. LOVE them! Will make them again. Thanks ! Can they be kept at ambient temperature? I’d recommend keeping them cool to ensure they don’t slide apart! Just made these for Mother’s Day! One thing I learned is that less is more when it comes to how much batter goes on the cookie sheet. At first, my batter wasn’t chilled enough and I was scooping way too much for each. This made them turn out VERY flat. Eventually I started using almost exactly one tbsp. per cake and they turned out perfectly. I’m serving mine with fresh strawberries and aquafaba whipped cream! Hi! this looks wonderful, I was wondering if you thought subbing in regular AP flour would be okay? (I’m not GF and I’m not necessarily willing to go out and buy the GF flour blends for just one recipe, haha). I made this recipe this weekend and they are delicious. The cakes were very flat and I’m wondering if substituting almond flour for almond meal caused this? Also, the cream is wonderful but not fluffy like in your picture. How did you get it so fluffy? Any hints or tips would be greatly appreciated. They are so much better than a boxed version we found in the grocery store. Thank you for sharing your amazing talent with us! My cream was fluffy and I think it was because I put it in the freezer and kept checking on it and stirring it. Then I whipped it with my Kitchen Aid mixer and it was thick and fluffy. Awesome! Thanks so much for sharing your success! About how long did you have it in the freezer? Great idea. Probably an hour and a half to two hours. Then checked it and stirred it up every 15 minutes or so, so it would get cold throughout and not just the edges. Thank you SO MUCH for this DELICIOUS recipe!! 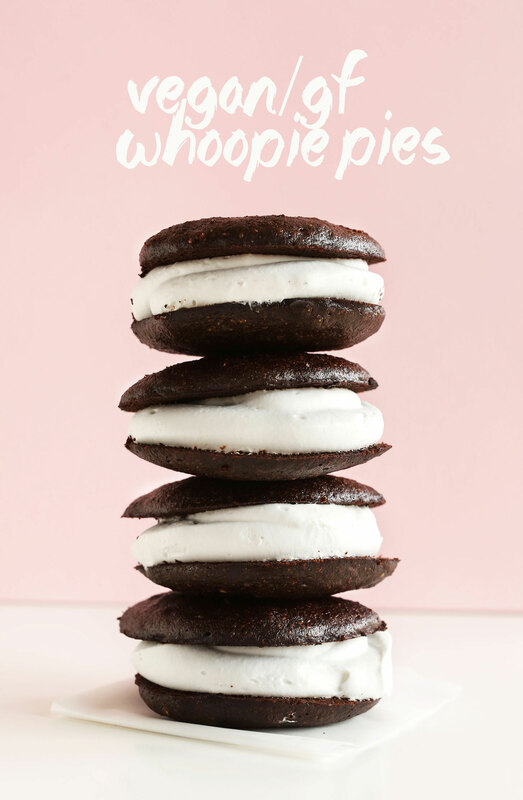 I grew up eating whoopie pies but haven’t had them for years because I’m now eating gluten & dairy free. I like that you use good ingredients, they are easy to make & they taste wonderful!!!!! The cake is fluffy & holds together well. I didn’t get as many “pies”, mine are about 2.5″ dia so I have 12 complete whoopie pies. Serving them for Easter! Hey! I made these this weekend and they were amazing! I was thinking of making a more Easter-themed version this weekend and having the cakes be vanilla funfetti instead. Do you think just using this recipe minus the cocoa powder should be good? And then just adding in a bit more vanilla extract and sprinkles? These came out fantastically! How do I make these vanilla?! So I’m running late on making these for my friends on V-Day only have one can of coco cream chilled. How long can I chill the coco cream before I can use it same day? So excited to try these! I replaced the oat flour and almond flour with teff flour, these were delicious! Well done again! Not too sweet, just right! I live in Kenya and can get most things on your recipes but one thing I struggle to find its applesauce. ( I found a tiny jar of it for the equivalent of $6!) I did try cooking up loads of apples to make my own but it made a recipe into a really long affair, can you think of a simple sub I could use? WOW, these are amazing! My kids loved them, and I loved that they make so many. I didn’t have coconut cream so we used vanilla ice cream. Definitely will make these again! I have an allergy to both almonds and oat- what could I use to sub for the oat flour, almond meal, and almond milk? I made these and they turned out AWFUL! The filling was runny and did not look anything like the photo pictured above. I used coconut milk on the first try and it was so soupy I threw it out. The second try was coconut cream and it was just a tad less runny than the coconut milk. Disappointing!! So bizarre! Did you chill the coconut whipped cream after whipping it? That helps it firm up. I am trying as much as possible to cut out all unnecessary oils from my diet. I noticed that there is both oil and applesauce in this recipe. I have used applesauce in place of oils in the past, and my desserts have come out just fine taste-wise. In this instance, would it be perfectly fine to leave out the oil and add in an extra 1/4 cup applesauce in place of it? Thanks for your baking expertise! Hi! I live in Australia, and I’ve looked everywhere but I can’t find anywhere that sells applesauce! Do you know any substitutes for that in the recipe? Beet, pumpkin or butternut squash puree should work! 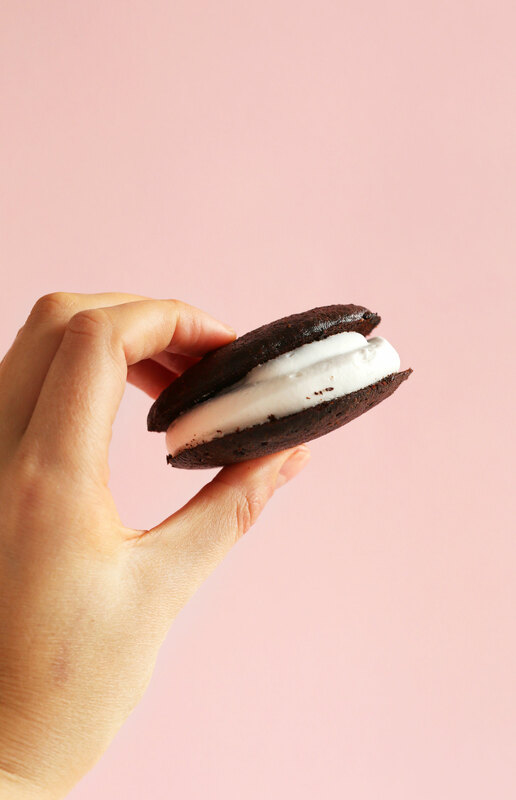 These vegan whoopie pies are THE BEST! I’ve made them twice now, and each time I make them I get so many comments about how delicious they are! In order to keep them fresh, I store the cookies/cakes and the filling separately until just before they’re ready to be eaten. Healthy and delicious! Thanks for sharing this recipe! So great! Thanks for sharing!! I want to make these for my son’s birthday celebration at school. I just want to check on the melting factor? Should I make them and them freeze or refrigerate them? I would refrigerate them, and then only keep them at room temperature for a max of a couple hours! Freezing them would be OK, but can make them a little too moist once thawed. Good luck! I’ve only had whoopie pies once- and I didn’t really like them. But I don’t see how I’m going to do anything but LOVE these. They’re perfect! I’d like to make these with just regular all-purpose flour instead of the gluten-free blend and oat flour. Can I substitute 1:1? Thank you! OMG, I just made these and my husband and I can’t get enough. Going to make a double batch tomorrow! Also, they freeze super nice. Just freeze on a baking sheet for a few hours and wrap individually. Take them out an hour before you want to eat them to unthaw. Perfect weekday treat!!! (and almost guilt free!) Thank you so much for this recipe!! I’m new(ish) to your site and can’t wait to explore your other recipes. I made these a few weeks ago for a family party and didn’t tell anyone they were gluten and dairy-free beforehand (besides my cousin who has both gluten and dairy allergies) and everyone loved them without even knowing the difference. The cake/cookies were divine, and although I don’t think my coconut cream ended up as whipped-creamy as the photos, I added peanut butter to it making peanut butter chocolate whoopie pies (SO GOOD) and that made up for the lack of volume in my whipped cream. SO wonderful! Thanks for sharing, Melanie!! I think you may have misread, there are no eggs in this recipe. I just got done making these today, I only ended up with 14 assembled woopie pies. I did find some of the ingredients a bit odd and cumbersome, but delicious! I would like to see a recipe for these with “regular” baking ingredients yet still vegan. I was wondering where to get or how to make the applesauce? Applesauce can be found at every supermarket. Otherwise you could blend up apples to make your own. What can I sub for the maple syrup or agave nectar? Coconut nectar or brown rice syrup? Hmm, and you did remember to add the baking soda? That can get overlooked in the almond milk step…As well as the baking powder? Also, did you remember to chill the batter? mine were very very fluffy, almost forgot the baking powder though. This looks delicious! Is there a way to substitute in regular flour for the almond meal and gluten free flours? Yes! I would just sub an even amount for those. What can I sub for the ingredients with nuts? We have kids with tree nut allergies. Cant wait to try this recipe! I would sub more oat flour, or gluten free (or all purpose) flour. These look amazing! Can I use 2 regular eggs if I’m not concerned about them being vegan? Also, we are GF and can not tolerate oats…can I use more GF flour or almond flour? That should work for the eggs! As for the oats, use a 1/2 and 1/2 mix of more almond meal + GF flour. Let me know how it goes! “So obviously we’re friends” I loved that line. Heart eyes emoji about everything else, of course. Thanks Kathryn :D Who wouldn’t be friends with a dessert-loving 3 year old!? 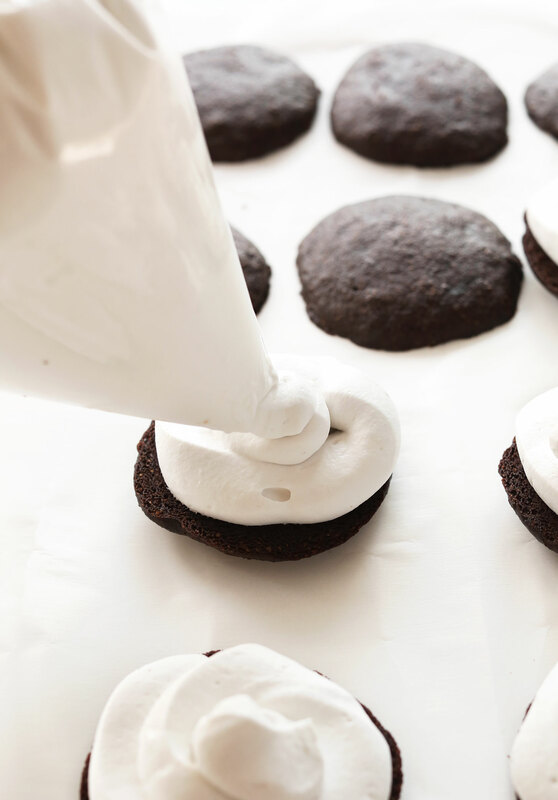 Whoopie pies that don’t require a special pan?! Sounds great! Oh, now this I have to try. & then a pumpkin version because I had the most delicious pumpkin whoopie pie at a pumpkin patch last year. Dana, you’ve done it again! oh man, these look so decadent! ? These look amazing with a capitol a. They are so perfect! 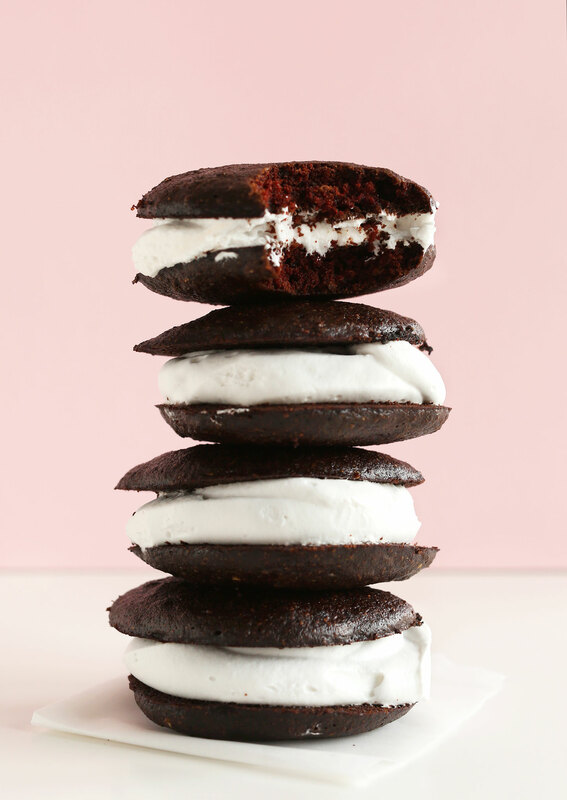 I love your whole photography setup, too- that tall stack of whoopie pie heaven?! Yum! When I saw the title of this post, I KNEW that I had another use for coconut cream at my disposal. 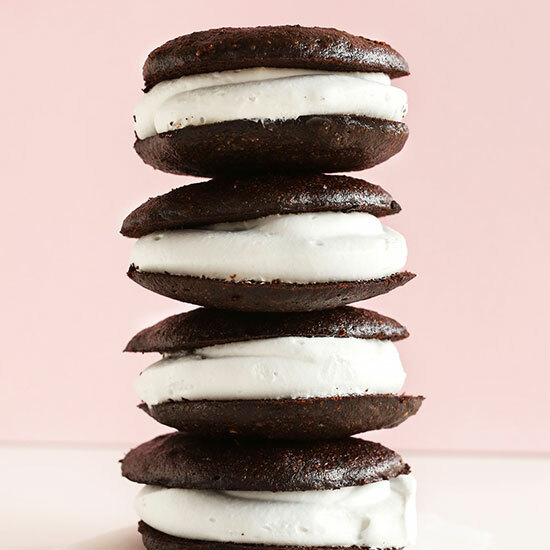 These vegan whoopie pies are definitely worth whooping over! Thanks Eliza! Hope you love these!! Coconut whipped cream is the best! These look fantastic! Wow! What a beautiful looking recipe! That filling looks so yummy! Yum. These look so good. And simple to make, the best kind of dessert!